“Life is like a public performance on the violin, in which you must learn the instrument as you go along,” wrote E.M. Forster, in Room With A View. I don’t know much about life, but getting fired, unexpectedly, publicly, certainly feels like that. Having gone through it, I’m always interested to see how others handle the experience. Hours after Rogers Media sacked him and 10 other News Radio 95.7 staffers, right-wing talk radio host Jordi Morgan posted “A note to Maritime Morning listeners” on his Facebook Page. 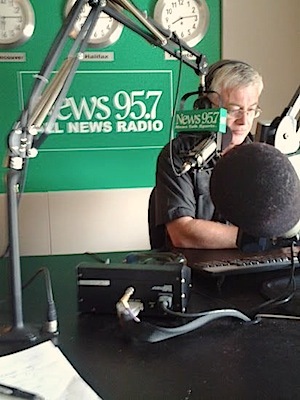 As you may have heard I will no longer be hosting Maritime Morning on News 95.7. Rogers has retooled to meet some very challenging market conditions and part of this process included the layoff of several personnel in Halifax. I just wanted to take a moment to thank all of the people who have contributed to the program over the past three years. Academics, politicians, experts and engaged citizens volunteered their time and ideas to help create a program our team was proud to be part of. I believe our program with the input of so many, has contributed value to the discussion around municipal, provincial and national issues and topics of general interest. While some may question the corporate decision makers, I want to take a moment to praise the efforts of Rogers media who have invested literally millions of dollars into our region by providing the content we have been able to provide. I will miss being with you all… but hope that you continue to support the efforts of Rogers and News 95.7 to continue to provide such an important private sector news voice… a rarity in the Canadian broadcast spectrum. Without you… it’s a tree falling in the forest. You might call this extreme grace and classiness—actually praising the people who showed you the door. In the half day since Morgan’s post went up, 150 fans—including Bill Stephenson, Marc Patrone, Rob Smith, Waye Mason, Charles Cirtwell, Eva Hoare, Keith Bain, Kim West, Laura Peck, Fiona Kirkpatrick, Barry James McLaughlin, Mike Melski, Sam Moon, Peter Moirera, John Campbelljohn, and Laura Smith—have showered him with words of regret, encouragement, gratitude, kindness, and praise. That such a diverse group of Maritimers could unite behind a right-wing host who once ran for the Alliance Party attests to Morgan’s deftness in dodging the pitfalls that give that breed a bad name. Mainly, he eschewed sophomoric rants, and treated contrary-minded guests with respect that felt genuine, not faked. Can anyone doubt he will land on his feet?